With its six sides this large hexagon is just waiting to be traced with nice straight clean lines. Put your pencil to the paper and trace the word, too in this shapes and their names page. 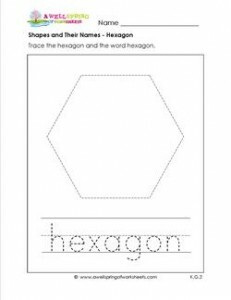 Please go to this page to see more shapes and their names worksheets in this set.